Fourth Row Center: Film Writings by Jason Bailey: Tribeca: "My Brothers"
The opening credit sequence of Paul Fraser’s My Brothers is a (presumably deliberate) homage to the kick-off of Scorsese’s Mean Streets--scratchy home movies centered on the screen with old-fashioned titles (down to the periods in the credits) underneath. It’s a strange shout-out, since I can’t imagine a film less like Mean Streets than this one, which is a quiet, melancholy little picture about three brothers preparing for their father’s death. But it does have one thing in common with Scorsese’s breakthrough film: a scrappily independent spirit, and a documentary-style sense of place. As the film begins, the father (Don Wycherley) is already knocking on death’s door. “Soon it will be over,” writes the oldest son, Noel (Timmy Creed). “Soon it will be every man for himself.” They’re dealing with the slow-motion tragedy in their own ways. Noel broods, writing poems and journals and generally being depressed. Youngest brother Scwally (TJ Griffin) is trying to remain practical: “If Daddy dies on the holidays,” he asks, “do we still get time off from school when we get back?” Middle child Paudie (Paul Courtney), a chubby jokester with big thick glasses framing his round face, tries to keep everyone entertained with his snappy retorts and funny songs (“I am a champion farter…” he croons, following a demonstration of his gifts). I have no idea how personal the tale is for screenwriter Will Collins (or director Fraser), but it feels personal, which is more important anyway. It knows these relationships inside out—the unfortunate fear that a child can feel for a dying relative, the camaraderie and humor shared by the two younger (and closer in age) siblings, and the brother dynamic, where “I’ll tell” is the ultimate rejoinder (“This ‘I’ll tell’ business won’t last forever,” warns Noel. “It’s all I’ve got, though!” Scwally replies). The picture is primarily structured around an impromptu road trip, and yes, it’s a construct. But it’s neither written nor played like one; it’s sort of become a road movie before we realize it. Noel has swiped his dad’s watch as something to remember him by, but a school bully snatches and smashes it. The young man then decides to “borrow” the van that he delivers bread in, and drive it down to the seaside arcade where “Da” got the timepiece in the first place. The brothers end up tagging along; car troubles and unfortunate encounters ensue, as do the expected flare-ups and fights. We can sometimes hear the story’s gears grinding—a scene where Paudie crashes a girls camogie practice is clumsily staged and structurally unfortunate, the sibling conflict arriving as if on a timer. But the scene that follows, in which Paudie stumbles across a creepy stranger, is subtly played while still coming across as genuinely frightening. And the journey gives Fraser (and cinematographer PJ Dillon) the opportunity for some lovely visual touches, like a scene where Paudie writes across the frame with a sparkler, or the evocative nightfall scenes at the seaside. Along the way, Noel meets a friendly young woman, with whom he shares a late night of drinking and confession. “I’m afraid they won’t remember Dad like I do,” he tells her. But late in the film, there’s an extraordinary scene where the boys, driving, listen to an audio tape of their dad in healthier times, joking and doting on his youngest son. It’s a deeply moving moment, a study in the power of the voice, but also in the memories that it conjures up. 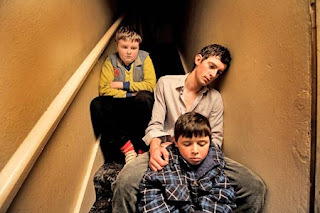 My Brothers is a sentimental tale, and the subject matter (as well as the powerful music by Gary Lightbody and Jacknife Lee) is emotionally charged. But they don’t overdo it; there’s an admirable elegance to the film’s simplicity and restraint. "My Brothers" screens April 25, 27, and 30 as part of the 2010 Tribeca Film Festival.